This chicken divine casserole is similar to the popular chicken divan. It's an easy dish that can be made on the stovetop or in the oven. This version, from Deary, is made with light mayonnaise and condensed soup. The easy sauce mixture is seasoned with lemon juice and curry powder, giving it a bit of an exotic flavor. 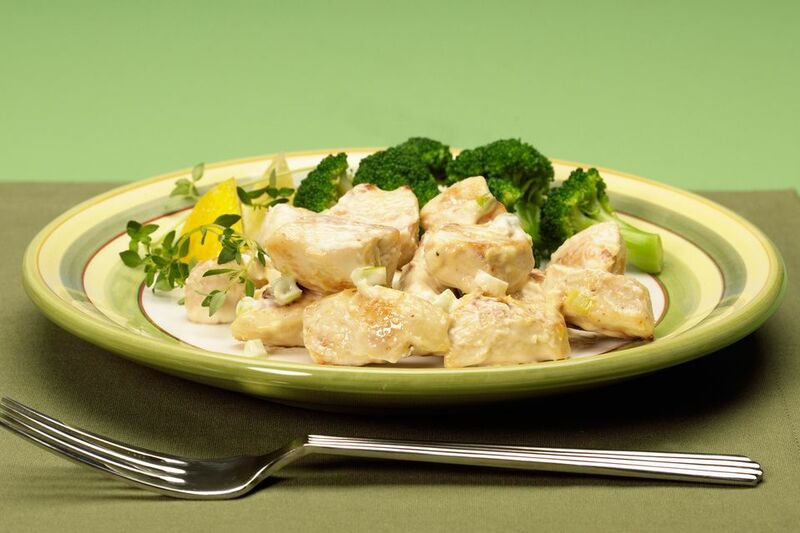 Serve the chicken dish with broccoli or your favorite side vegetable. Heat the oven to 375 F. Butter a 9-by-13-inch baking pan. Arrange the chicken in the prepared baking pan. Combine the soup, mayonnaise, lemon juice, and curry powder; pour over the chicken. Cover the pan tightly with foil and bake for 1 hour. Uncover and top with cheddar cheese; continue baking just until the cheese has melted. Serve with hot cooked rice and steamed broccoli, if desired. Put a large skillet or saute pan over medium heat with 2 tablespoons of olive oil or butter. Add the chicken and cook, stirring, until the chicken is lightly browned. Add the soup, mayonnaise, lemon juice, and curry powder. Simmer for 15 to 20 minutes. Add 12 to 16 ounces of fresh or frozen steamed broccoli the last few minutes, if desired, or serve the broccoli as a side dish. Serving Suggestion: Arrange the chicken and broccoli on hot cooked rice on a serving platter. Spoon the sauce over the chicken and sprinkle with cheddar cheese, if desired. Garnish the chicken and sauce with fresh chopped cilantro, parsley, or sliced green onions. Add some of the finely grated zest of the lemon along with the lemon juice.